The Annual Meeting of the American Society for Cell Biology convened in San Francisco, California, in December 2012. Among the more than 100 scientific sessions and 3,000 poster presentations, a group of scholarly journal editors and publishers met to discuss an issue which has long pressed on many of the brightest minds in their field. This was not a purely scientific problem, but one which they nonetheless felt had the potential to affect the evaluation – and so the conduct – of research in cell biology and beyond. Do not use journal-based metrics, such as Journal Impact Factors, as a surrogate measure of the quality of individual research articles, to assess an individual scientist's contributions, or in hiring, promotion, or funding decisions. The Declaration goes on list specific recommendations to key groups, including funding agencies, institutions, publishers, organizations supplying metrics, and researchers themselves. At the time of writing, DORA has more than 4,000 individual signatories and over 160 organizations have also signaled their support. We offer clear guidance for editors, authors and readers on the appropriate use and interpretation of the Impact Factor on our Journal Metrics website, alongside details of other journal- and author-level metrics which can provide a complementary perspective on journal impact and relevance. Last December, I posted a webcast titled "The Impact Factor and other Bibliometric Indicators" here on Elsevier Connect. Finally, Elsevier has recently invested in two further advances in delivering a range of metrics to these groups (see boxed text). Article-level citation metrics are available in Elsevier's full-text platform ScienceDirect, sourced from our abstract and citation index, Scopus. Scopus itself also features the Altmetric app, which tracks mentions of each article in traditional and social media online. Finally, within the researcher productivity and collaboration platform Mendeley (acquired by Elsevier in April), the need to assess research regardless of the journal that published it is met by providing aggregated readership data of papers as a complement to both citations and downloads. 6. Greatly reduce emphasis on the journal impact factor as a promotional tool, ideally by ceasing to promote the impact factor or by presenting the metric in the context of a variety of journal-based metrics (e.g., 5-year impact factor, Eigenfactor, SCImago, h-index, editorial and publication times, etc.) that provide a richer view of journal performance. On the first two of these points, the methodology underpinning the two journal-level metrics that are computed using Scopus data (SNIP and SJR) has been published in the peer-reviewed literature, and the metrics themselves are freely available on our Journal Metrics website for downloading and re-use. On the last point, SNIP (and especially the newly-revised method now available) intrinsically accounts for differential citation practices in different fields of research, allowing the direct comparison of SNIP values across all journals. Elsevier uses the Impact Factor (IF) as one of a number of performance indicators for journals. It acknowledges the many caveats associated with its use and strives to share best practice with its authors, editors, readers and other stakeholders in scholarly communication. Elsevier seeks clarity and openness in all communications relating to the IF and does not condone the practice of manipulation of the IF for its own sake. For us, the important part of DORA is addressing the misuse of the Impact Factor in researcher assessment. We hear from our researchers that they want a better way to assess research, wherever it may have been published. Mendeley meets this need by sharing aggregated data on the readership of papers on Mendeley as an open and more rapid complement to citations or downloads. Any metric can be gamed, of course, but when you have a panel of correlated metrics, it gets exponentially harder to do so, and that's why we support the researcher assessment aims of DORA, even as we agree that the Impact Factor retains value as an indication of journal influence. DORA contains several recommendations aimed at research funders, institutions and researchers. While Elsevier takes great interest in these recommendations, given that their target audiences comprise many of Elsevier's key partners in the research ecosystem, we do not feel it appropriate for Elsevier to take a position on those points. For this reason, Elsevier does not intend to sign to the entirety of the Declaration but we appreciate why others would do so (including Mendeley, see box). Instead, we reiterate that Elsevier welcomes this development in the spirit of an open and informed debate on the future of scholarly research assessment and looks forward to engaging even more deeply with the originators of DORA, its signatories, and those groups to whom it is addressed. 1 Misteli, T. (2013) "Eliminating the impact of the Impact Factor." The Journal of Cell Biology. Retrieved from http://jcb.rupress.org/content/early/2013/05/21/jcb.201304162.full on 24 May 2013. 2 Amin, M and Mabe, M. (2000) "Impact Factors: Use and Abuse." Perspectives in Publishing No. 1. Retrieved from http://cdn.elsevier.com/assets/pdf_file/0014/111425/Perspectives1.pdf on 24 May 2013. 3 Vanclay, J.K. (2012) "Impact Factor: Outdated artefact or stepping-stone to journal certification?" Scientometrics 92 (2), 211–238. This article was also cited in DORA. 4 Moed, H.F., Colledge, L., Reedijk, J., Moya-Anegon, F., Guerrero-Bote, V., Plume, A., Amin, M. (2012) "Citation-based metrics are appropriate tools in journal assessment provided that they are accurate and used in an informed way." Scientometrics, 92 (2), pp. 367-376. Dr. Andrew Plume is Associate Director – Scientometrics & Market Analysis in Research & Academic Relations at Elsevier, specializing in scientometrics (the scientific qualification and analysis of science). Through accumulating a broad spectrum of data that ranges from specific primary sources such as authors and single articles to the broadest data resources generated from countries and entire subject domains, he studies information flows in the scholarly literature by analyzing patterns of publications and citations. His particular interest lies in the use (and abuse) of the Impact Factor and the emergence of alternative metrics for journal evaluation. Dr. Plume frequently presents these topics, among others, to journal editors, learned and scholarly societies, and the publishing community. 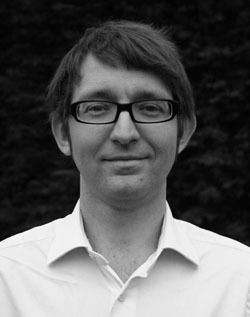 After taking his PhD in plant molecular biology from the University of Queensland (Australia), and conducting post-doctoral research at Imperial College London, Dr. Plume joined Elsevier in 2004. He has co-authored research and review articles in the peer-reviewed literature and is a member of the editorial board of Research Trends." The science of science is more than simply crunching numbers for their own sake," he writes. "It's about detecting patterns amongst the noise that tell us something about the fundamental workings of scholarly communication. Science is a very - arguably the most - human pursuit, and we see that emerge in our analyses every day." In determining the impact factor by the only one variable of the number of readers does not seem right, we should also look at the degree of specialization of publication, etc. Until a better, free, system is available I am happy with IF with one caveat - it has to be freely available (no cost) and not controlled commercially as it is now.